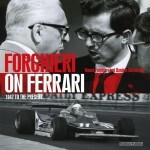 People who like round numbers, and follow auto racing, will know that the year this book was published—2011—was the 50th anniversary of the first Formula 1 Grand Prix at Watkins Glen. That was 1961, by which time The Glen had been successfully hosting races for over a decade. But it was that race that brought the international crop of F1 racers here for the first time—and say the words that must have been music to the ears of the man who had been the moving force behind creating a road race here, Cameron Argetsinger: they compared it to European circuits, in fact they compared the difficulty of the original (1948–52) 6.6-mile track to that of the famed Nürburgring which is exactly what he had been intending. The Glen would host the Formula 1 United States Grand Prix for 20 consecutive years, and pretty much any other kind of racing into the present time. It is rightly the “birthplace” of organized road racing in America and it was another 50th anniversary that prompted Defechereux to write about it the first time around. That was in 1998, the year that also saw the founding of the Watkins Glen International Motor Racing Research Center, headed by Cam Argetsinger’s eldest son J.C.
1948 is when The Glen officially opened for business and the story of its founding and the first five years of racing on country roads, until the opening of the permanent track in 1953 in the wake of a fatal accident, are presented here. 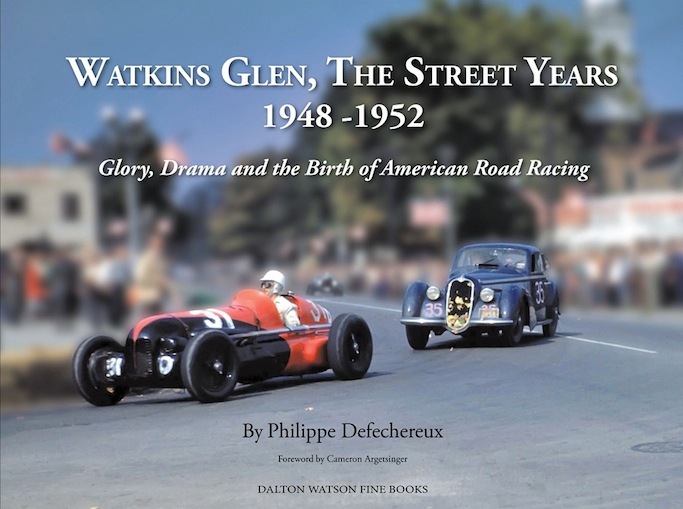 Even if you already have Defechereux’s 1998 book (Watkins Glen 1948–1952: The Definitive Illustrated History, ISBN 978-0929758176) this new one is sufficiently improved to leave the old one in the dust, as it were. More photos, more color, more background—a bigger, better, deeper, rounder story even if the new book has only about 20 more pages. It is nothing short of remarkable how much Defechereux has managed to pack into this relatively small book. Must be his advertising background (Ogilvy & Mather, DDB Needham). He is a native of Belgium—home of that fabled circuit, Spa-Francorchamps—who has pitched his tent in the US since 1969, which means that he himself has a sense for the dis/similarities between circuits here and there. 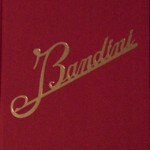 He previously wrote a James Dean book for the same publisher. It would not be exaggeration to say that Defechereux creates a mood in this book, a fully fleshed-out multi-faceted world made manifest in narrative, anecdotes, quotes, and over 300 photos (of which only about 13 avail themselves of the book’s 12˝ landscape format). The story about little Watkins Glen is told against the big backdrop of the whole panoply of racing in general and European racing in particular. Cam Argetsinger had written the Foreword to the 1998 book and it is here used again, posthumously, as he died in 2008. The main point he makes in it is that “America was ready for road racing;” if he hadn’t spearheaded the effort someone else would have. This perfectly illustrates just how different Argetsinger and his chums thought. None other than, for instance, Indianapolis Speedway chief Wilbur Shaw predicted utter failure. 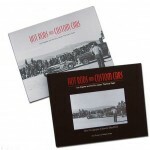 In fact, this divide between the oval racing and road racing camps is a key theme throughout the book. Defechereux argues, and who could contradict him, that it exists to this day. And, he says, Watkins Glen-style sports car racing bridges that gap—an argument sure to lead to interminable, fruitless discussions. 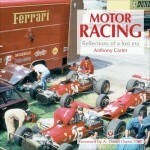 The Introduction sets the scene by painting a picture of political and economic conditions in postwar America, the situation at Indy, and the ultimate aligning of the stars that would usher in road racing in North America. (Readers familiar with the latter aspect may find Defechereux’s comments about the SCCA rather too charitable. It is not polite to say so but it was a parochial, disorganized body and it is nothing short of amazing that it got its act together.) The renaissance of the European racing scene with its storied drivers and cars is presented as a crucial catalyst for inspiring American enthusiasts. 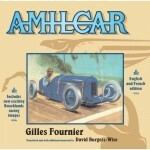 Several sidebars pursue ancillary threads such as the origin of GP racing, personality profiles, the Collins trophy etc. 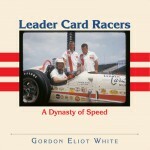 The 13 races are presented in chronological order, with much attention to local color to capture the “flavor.” Inter-race activity, such as position changes and lap times, are interspersed in the text but full race results and statistics for all entrants are organized in detailed, uniform tables that, in this new edition, fall within each chapter and not at the back of the book. Probably because several books in the last few years have focused on the relationship between the Strategic Air Command and the SCCA a new Epilogue addresses that aspect, along with the growing-up of the SCCA and foreshadowing the two decades of F1 GP at Watkins Glen. The latter is, incidentally, the subject of a stand-alone brand-new book by another of Cam’s sons, Michael (Formula One at Watkins Glen, ISBN 978-1-935007-14-2). 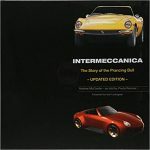 Two closing chapters highlight the fates and current whereabouts of some of the vintage iron and showcase some of the high-end “civilian” passenger cars that ambled about the environs or participated in the concours d’elégance that took place on race weekends. The color photos are remarkable for how well they held up; they were of course quite an expensive novelty in their day. Lest you assume uncanny camera technique behind the cover photo realize that it is a heavily massaged rendition (it is again shown on p. 23, with all the background noise). 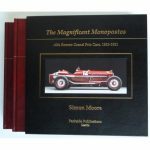 All the illustrations are thoroughly captioned and credited; there are also a few technical drawings, three examples of fine art, and assorted race posters, brochures, ads etc. The Index only lists people no cars, but seems comprehensive. An almost pointless observation: this book, while thoroughly nice in every regard, is rather on the cheap end of the Dalton Watson spectrum. And the typo chasers did not come home empty-handed . . . Note that there is also a TV documentary of the same name, produced by WSKG and directed by Brian Frey.